The Strymon Multi-Switch expands on the functionality of the TimeLine, BigSky & Mobius by giving you a few more buttons to help control all the capabilities of these extensive pedals! 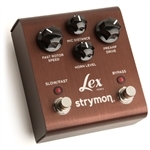 The Multi-Switch gives you several expanded looping functions including: Reverse, Half Speed and Undo/Redo. There are two way to use the MultiSwitch with the looper function. 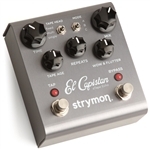 You can use it as a 3-button looper, allowing you access to the record/overdub, play and stop functions without having to hold the tap button to enter the looper mode and it allows you to still have control over your delay sounds. Or, you can use it as a 6-button Looper control by holding the TimeLine's tap switch to enter the Looper mode and now the Reverse, Half Speed and Undo/Redo controls will be available on the MultiSwitch. While in the Bank Mode, the MultiSwitch allows you to cycle through the banks, as well as your presets without stepping on multiple buttons. Use the left button to move down the bank, the middle button to cycle through your presets and the right button to move up the bank. While in the Preset Mode, you can cycle forward and back through your presets using the left and right buttons on the MultiSwitch and engage or turn off the preset using the center button. With the Tap Mode engaged the MultiSwitch allows you to cycle through your presets using the left and right buttons and the middle switch allows you to set your tap tempo or modulation speed. 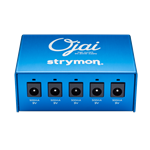 The Strymon Ojai is a high current DC power supply with huge horsepower in a small footprint. It's one of the highest powered, most technologically advanced power bricks in its class. This lightweight, expandable power supply has five high current, individually isolated, ultra-low noise outputs, providing 500mA of current in each output.